The Alpha-II is the ultimate in luxury cruising. If you enjoy high speed water sport, prepare to be seduced. High performance and great handling are not enough - a true Hovercraft must also have the power to seduce and entertain you. These unique models offer an exciting but rare combination of style, speed and comfort along with environmental friendliness. Here you meet the best available craft for both commercial and recreational use. The choice for our customers is virtually unlimited. The Alpha-II has vast operating range including but certainly not limited to recreational yachting, convenient VIP transportation services (6 pax license ) as well as cruise ship tender (rescue man over board - ship to shore transportation in case of emergency transport) which requires amphibious capability. The Alpha-II is unlike any other Hovercraft. You can feel the difference in the first few miles of flight- since your ideas are included in the development of your craft. The relationship between craft and pilot is extraordinarily close, and through this intimacy you feel more in control, more in touch with the way the craft handles and behaves. 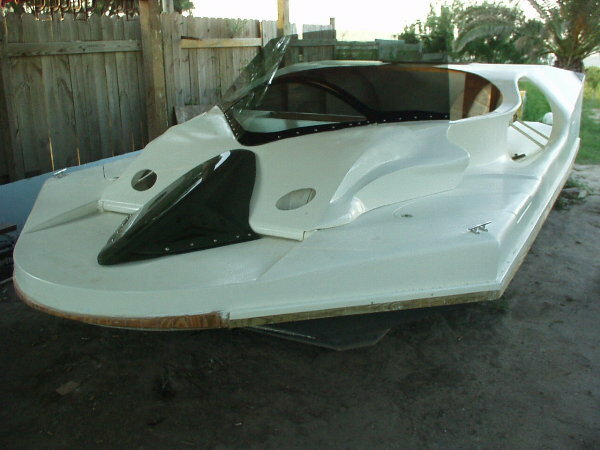 This aggressive Hovercraft is available with your personal custom build cabin section for either 5 persons (23' length ) or 7 persons ( 25' length ). The powerful lift unit as well as thrust unit are fix components for all four models of the Alpha-II series. This allows a big amount of flexibility in the passenger / payload area while a proven performance in the whole design series with relatively short set up time for each model. 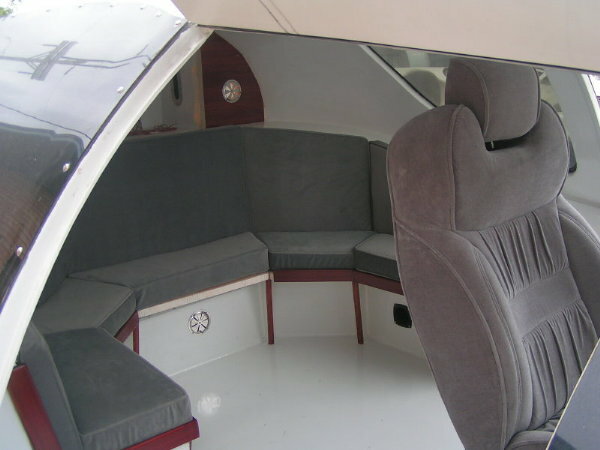 It allows us to concentrate all our attention to your custom build cabin and helms area. As seen in the following custom layout. The key features of the Alpha-II exceed Hovercraft standards. - B13 Rotary engine as power plant with quiet 175 Hp on base engine. - 4 totally enclosed thrust fans for low Db level. - large amount of watertight flotation compartments for your safety. As well as the Alpha II flight control system is intended to provide a more natural driving experience for the operator. The unique control surfaces operate in both the thrust and speed generated air stream domains. Fuel consumption : 5 gal / hour cruising 7 gal / hour max. Fuel capacity : 24 gal. If you find something related to this beauty - please let me know !